Wonder Woman Day on Saturday! Welcome to this week's dashboard post, intended to keep you updated on all that's happening at ol' Fantom. Friday, June 2 – Friday Night Magic – Booster draft and casual play! Everyone's invited. Saturday, June 3 – Wonder Woman Day – To celebrate the release of the Wonder Woman film and her 75th anniversary, we'll be doing all sorts of sales, giveaways, activities, and more. And in the evening, it's Fantom Femme Night: Amazon Edition! ANY AND ALL WONDER WOMAN COSPLAY ENCOURAGED! Saturday, June 3 – Fantom Femme Night: Amazon Edition – In honor of Wonder Woman's 75th anniversary and Wonder Woman Day, we're turning Fantom into Paradise Island! Don your Amazonian best, grab some snacks and get ready for a night of fun worthy of the original Warrior Princess! Sunday, June 4 – Black Excellence Book Club: Your Black Friend – "Ben Passmore's necessary contribution to the dialogue around race in the United States, Your Black Friend is an open letter from your black friend to you about race, racism, friendship and alienation." Monday, June 5 – Comics & Cocktails – Join us for drinks, food and geeky talk! All are welcome! 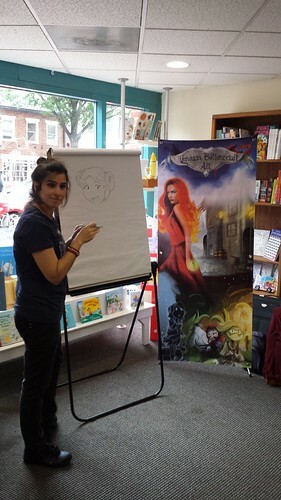 NPR: "Kids Craft Comics To Explore Immigration Fears"
"I feel sad, angry, and not cheerful. I would not like it in Mexico because I don't speak Spanish." "One thing that's been really nice about it is the kids talking about how they can sleep better," instructor Nora Litz says in the video. "They're not so worried like they were in the beginning." 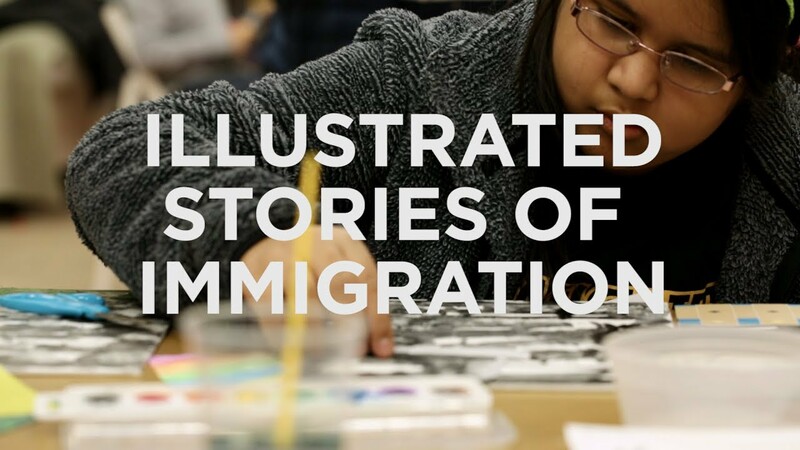 "Illustrated Migration Stories" is only one of many writing classes Mighty Writers puts on for children. Their summer offerings include classes on girl power, political protest, sports and hip-hop, poetry, web design, cinema, and much more. American Association for the Advance of Science (AAAS)'s S.T.E.A.M. 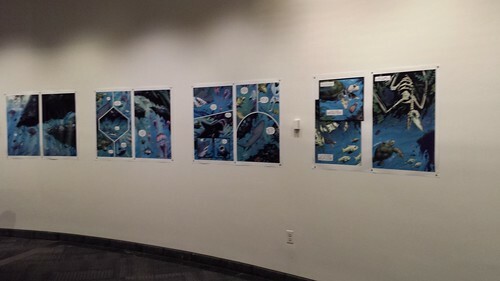 exhibit on educational comics, Within the Panels, with Matt Dembicki. 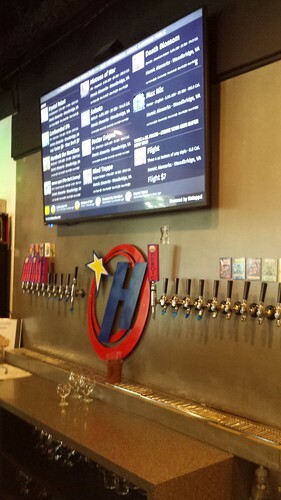 Heroic Aleworks brewery in Woodbridge, VA held a mini comics-con with DC Conspiracy members. 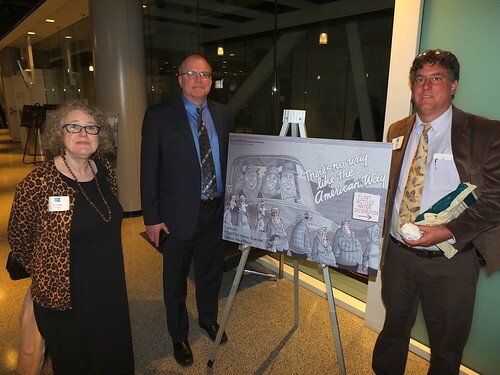 RFK awards 2017 - Mike Thompson won the cartoon award for a series on Flint, Michigan's water. Newspaper Panel Feature: Nick Galifianakis, Washington Post News Syndicate, "Nick & Zuzu." A look back at Wonder Woman's feminist (and not-so-feminist) history [in print as A feminist icon - except when she wasn't]. 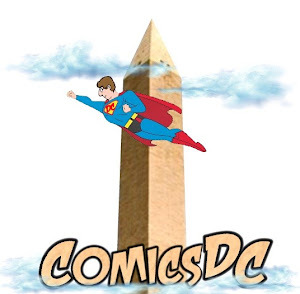 The Library of Congress is gearing up for a super summer treat celebrating the role of comics and graphic novels in promoting literacy, as collectibles, in the arts, advertising, sociology, popular culture and history. Making a variety of collection items more accessible to the general public, the "Library of Awesome" features a pop-up display of famous comic-book issues, drawings, original comic strips and related items. Programming for all ages will be offered. Nearly 100 comic-book collection items will be on display for "Library of Awesome," a pop-up exhibit featuring items from the Library's comic-book collections presented in conjunction with Awesome-Con, Washington, D.C.'s annual convention of comics, cosplay and pop culture. The display will be on view Wednesday, June 14 – Saturday, June 17 on the first floor of the Thomas Jefferson Building, 10 First Street S.E., Washington D.C. Tickets are not required. "Comic books attract fans and collectors of all ages. What many people might not know is that the Library of Congress is a collector as well," said Librarian of Congress Carla Hayden. "We have the world's largest collection of comic books, and I am so pleased we can share some of them during this special display. I hope this experience will inspire visitors to further explore our collections and discover other surprises." The collections of the Library of Congress include nearly 140,000 comic books dating back to the 1930s. Visitors will see famous editions of such comic-book characters as Wonder Woman, Superman and some of the most significant artwork and storylines in comic-book history. These include original artwork for the first appearance of Spider-Man and the American classic known as Famous Funnies No. 1 (1934), considered by many to be the first American comic book. First appearances of Batman, the Fantastic Four and the Incredible Hulk will be on display, as well as rare early science fiction and children's comics. The exhibit will also feature first issues of Archie, Luke Cage: Hero for Hire and Supergirl. Additional programming includes a family-friendly costume contest with a chance to win a pair of tickets to Awesome-Con 2017, workshops and demonstrations. Events are free and open to the public. Visitors who come to "Library of Awesome" dressed in a superhero character costume will receive a 15 percent discount on merchandise at the Library of Congress Shop. Media wishing to cover the event must RSVP no later than Thursday, June 1. Additional details about coverage opportunities will follow. The excitement can be followed on Twitter at @librarycongress and #LCcomics. Visitors are invited to explore this pop-up display of more than 100 iconic comic-book issues of today's most popular characters. The display will feature multiple themes including Wonder Woman and milestones, Marvel Comics, DC Comics, children's comics and sci-fi comics. Free and open to the public. No tickets required. Library Technician Ashley Dickerson and other cosplayers will demonstrate how they develop characters. Free and open to the public. No tickets required. Library of Congress Young Readers Center staff and cosplayers will teach visitors how to make superhero arm gauntlets using basic craft supplies. Kids are encouraged to come dressed as their favorite characters. Free and open to the public. No tickets required. Get your capes ready! Come dressed up as your favorite comic-book character for the ultimate costume contest. There will be separate categories for children and adult participants. The winners of the adult contest will receive a pair of passes to 2017 Awesome-Con to be held at the Walter E. Washington Convention Center. Free and open to the public. Reservations required; visit Eventbrite for reservation and official contest rules. Young Readers Center staff will host activities all day, including drawing comic books, creating props, and assembling costumes. Visitors will also be able to explore comic books, graphic novels and other Young Readers Center collections and partake in superhero and sci-fi-themed photo shoots. Join Library of Congress staff members, including Senior Rare Book Conservator Claire Dekle, Curator of Popular and Applied Graphic Art Sara W. Duke, Reference Specialist Megan Halsband, Head of the Newspaper Section Georgia Higley and Curator of Popular and Applied Graphic Art Martha H. Kennedy, for a panel discussion about the original art and collections held at the Library. Panelists will share highlights of the collections, provide insights on the conservation and preservation of this material, and suggest how attendees might come to use the Library's collections for their own research. *Awesome-Con 2017 ticket required for attendance. The Library of Awesome is made possible by gifts to the Library of Congress Fund. Those interested in supporting free programs at the Library can contact devofc@loc.gov. The Serial and Government Publications Division maintains one of the most extensive newspaper collections in the world. It is exceptionally strong in United States newspapers, with 9,000 titles covering the past three centuries. With over 25,000 non-U.S. titles, it is the largest collection of overseas newspapers in the world. Beyond its newspaper holdings, the division also has extensive collections of current periodicals, comic books and government publications. The comic-book collection is available for research use by scholars, collectors, and other researchers in the Newspaper and Current Periodical Reading Room; for more information visit www.loc.gov/rr/news/coll/049.html. The Library of Congress is the world's largest library, offering access to the creative record of the United States—and extensive materials from around the world—both on-site and online. It is the main research arm of the U.S. Congress and the home of the U.S. Copyright Office. Explore collections, reference services and other programs and plan a visit at loc.gov, access the official site for U.S. federal legislative information at congress.gov, and register creative works of authorship at copyright.gov. Anime USA 2017 Newsletter, Volume 5: Memorial Day Membership Discount! In honor of Memorial Day we are offering 33% off a Regular membership and 25% off a Silver membership from today through 31 May 2017. Use discount code MEM2017 at checkout to receive the discount. We are proud to announce three additional guests in our educational and cultural track. 15 years ago Briana Lawrence (Brichibi Cosplays) and Jessica Walsh (SnowCosplays) were two fanfiction writing ladies who geeked out over Gundam Wing boys and Resident Evil. Now? 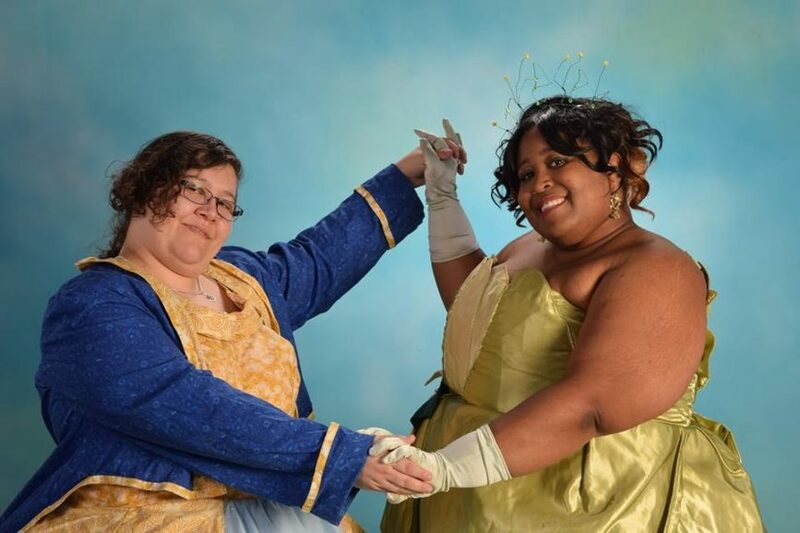 They're still geeks and still have their fandoms, but they're also a cosplaying couple who write books, make crafts, and are generally nerdy women. Snow is the seamstress of the couple, meanwhile, Brichibi talks about issues in the cosplay community and how the most important thing about cosplay is to love yourself and have fun. The two ladies also speak on the importance of diversity when it comes to writing and pop culture, and they've both written about it via personal blogs and various websites. 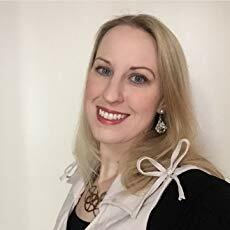 Speaking of writing, the ladies have work published through Dreamspinner Press, both write freelance for WatchMojo.com, and they also self-publish their own series of books. 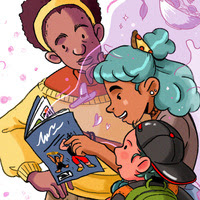 Brichibi is currently working on a black, queer, magical girl series called "magnifiqueNOIR," and the two will soon be working on the third book in their "Hunters" series. When going to conventions they always bring their best so that they can promote their work. You can enjoy their crafts, get lost in their book series, or heck, you can come by for a hug and fun conversations about cosplay, anime, or video games. Always promoting positivity and always supporting one another, Brichibi and Snow are smiling their way through the geek scene. Exhibit or Present at Anime USA. Anime USA's host hotel is the Washington Marriott Wardman Park. Rooms are $167 a night plus tax. There will be a non-refundable $50 deposit for each room. Reply to this e-mail and we'll be happy to answer them for you! Copyright © 2017 Anime USA, All rights reserved. Note to our readers: Thank you for reading our special announcement. We respect your privacy. We will never sell your information to a third-party. If you did not intend to sign up for this newsletter, we apologize for the inconvenience. Please do not mark us as spam. Our famous summer reader poll is back, and this year we're all about comics and graphic novels! Whether it's your childhood favorite or the webcomic you binged last week, we want to know about it. 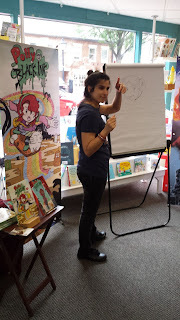 Last weekend, I briefly stopped in the Hooray for Books bookstore in Alexandria on Saturday to meet Portuguese cartoonist Vanessa Bettencourt who was doing a drawing workshop for children, and I enjoyed seeing her interact with the kids in the audience. She agreed to answer our usual questions about her journey from Europe to northern Virginia. 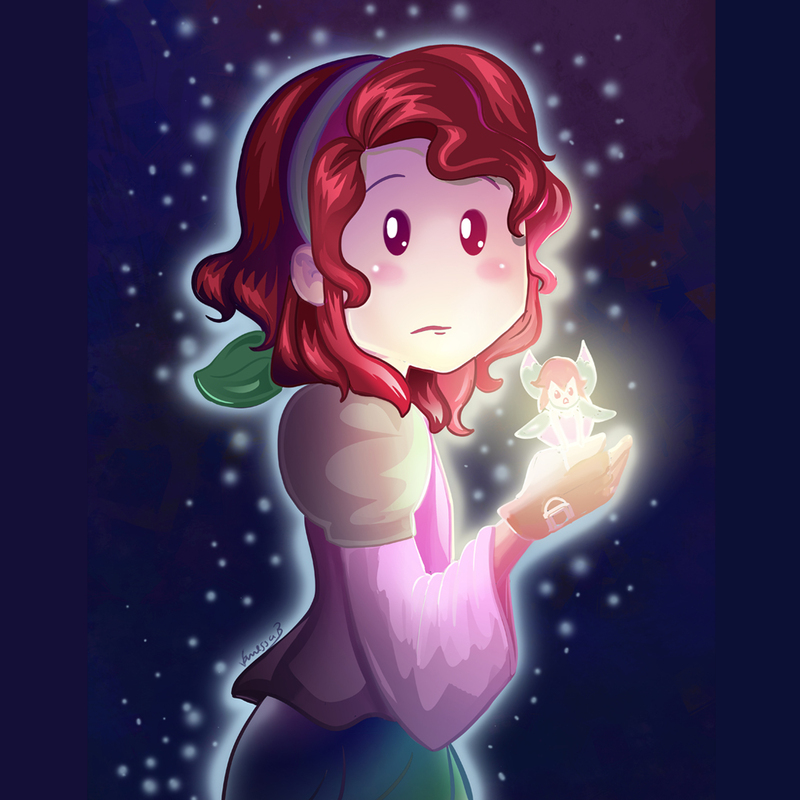 My comics have a lot of humor and fantasy and a mix of manga and Disney styles together. When I'm not working on commissions for business, websites or people who want their portraits as comic characters, I work diligently on my personal projects. I work daily on my free webcomic series, Notfrombrazil.com. It started as an effective way to communicate with Jon, my fiancé in a long-distance relationship, and became a way to share my life with those who stayed behind at home after I moved from Portugal to the USA. 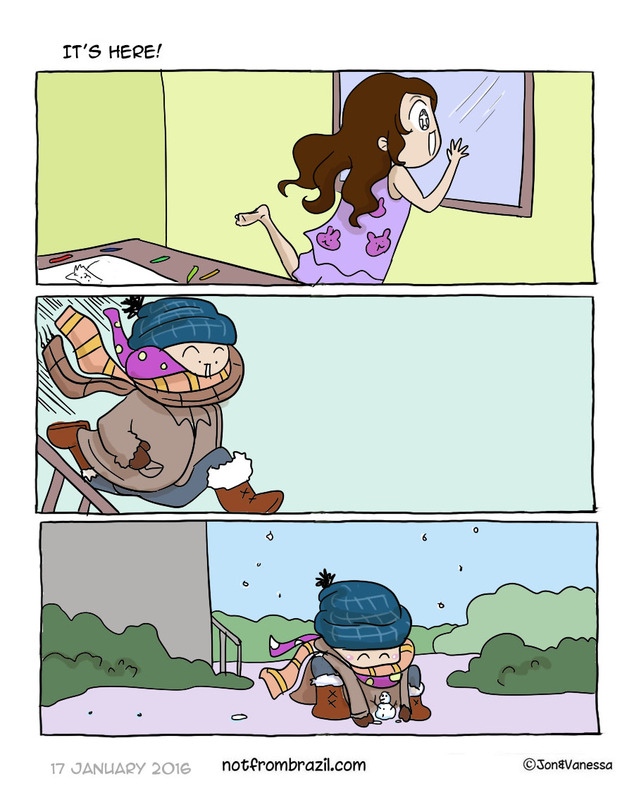 Now I share my daily adventures as a freelance artist in the USA. In 2015 I set a goal of a year to write, illustrate and completely finish a graphic novel on my own. I accomplished the goal. 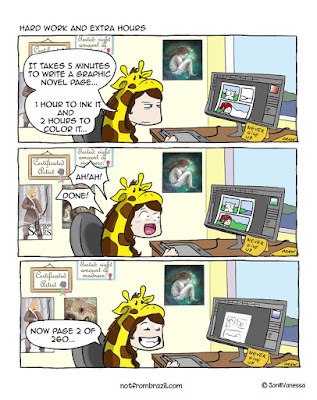 Polly and the Black Ink is 520 full-color pages that I divided into five paperbacks. The first three volumes are already available. Sometimes I take commissions to do political cartoons (as happened with the Brady Campaign to Prevent Gun Violence), but between social and political I favor social issues. For Polly and the Black Ink, I drew and wrote it all in paper for a few months first, then I scanned it and edited before the digital process of inking, coloring and adding the text. I write the text as I draw the scenes, instead of having a script. This way I have a better sense of space and where the text will fit in each panel. This is my first graphic novel and I learned a lot, especially about writing short but meaningful sentences when sometimes I feel the character has so much more to say. For notfrombrazil.com I only work digitally. I have my format and I stick to it. Commissions can be digital or traditional. I use Photoshop and I recently upgraded from an Intuos3 to a Cintiq 13HD. I was born in December, 1979 in Lisbon, Portugal. I moved to the USA in 2015. I met my fiancé in 2012 when he hired me to draw all the covers for his epic fantasy series Heir of Scars, including chapter illustrations and maps. 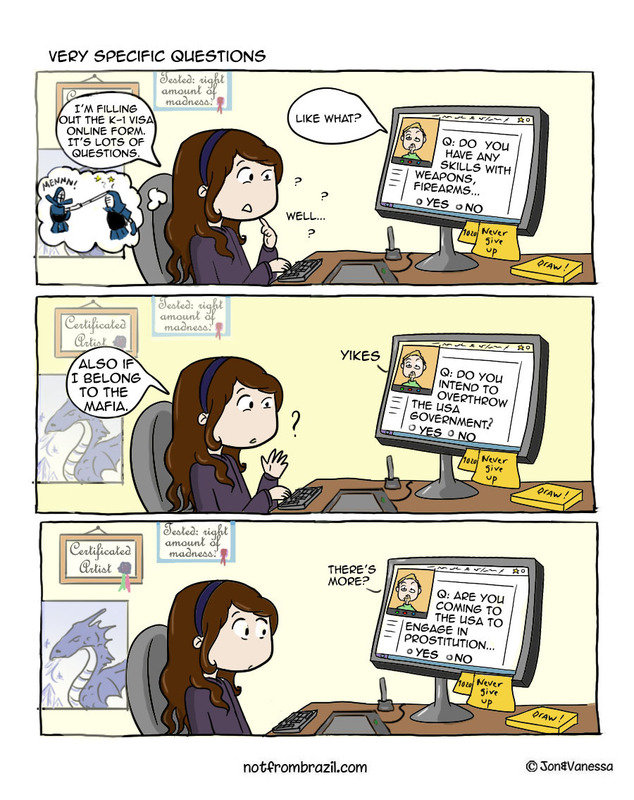 A few years later we started the K1 Visa (fiancée process), which I describe with a lot of humor in notfrombrazil.com. He was currently working in DC so we decided to stay. I'm a freelance artist so it's easier to adapt. We live in Alexandria near the Potomac river. As a Portuguese soul, I miss the ocean a lot, so the river is nice to have nearby. I have a degree in Portuguese and English literature. I became a teacher and worked for publishers as a fantasy illustrator Then, I returned to college for Fine Arts while I worked. 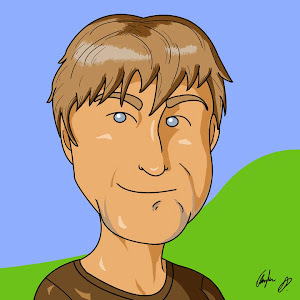 I'm self-taught when it comes to comic books and cartoons. I started drawing this style for fun. A simple away to share my day with Jon then it became more serious. I intend to continue to learn, share and create more stories and worlds. For comics and cartooning: Calvin and Hobbes’ Bill Waterson, Bones by Jeff Smith, Asterix, Turma da Monica by Mauricio de Sousa, Hagar the Horrible by Chris Browne, W.I.T.C.H fantasy series, Naoko Takeuchi (Sailor Moon), Akihiro Yamada (Junni Kokki - The Twelve Kingdoms artist), all Disney, many manga, anime and fantasy books. And for the surreal humor with a lot of nonsense: Mortadelo & Filemon by Francisco Ibanez Talavera, Guillermo Mordillo, Janguru wa Itsumo Hare Nochi Guu manga. Sometimes I want to go back and retouch finished work. In the beginning, I wished I had more time to finish a cover or a project, but to get the commission we have to go with the publisher's schedule. Notfrombrazil, because for the past two years I’ve been uploading thrice a week online, on the usual social media and in platforms such as tapastic and LINE Webtoon. Polly and the Black Ink. I am really happy that I was able to create a compelling world, story and characters with a lot of adventure, action, mystery and fantasy parallel worlds that children, teens and adults feel compelled to read and discover. 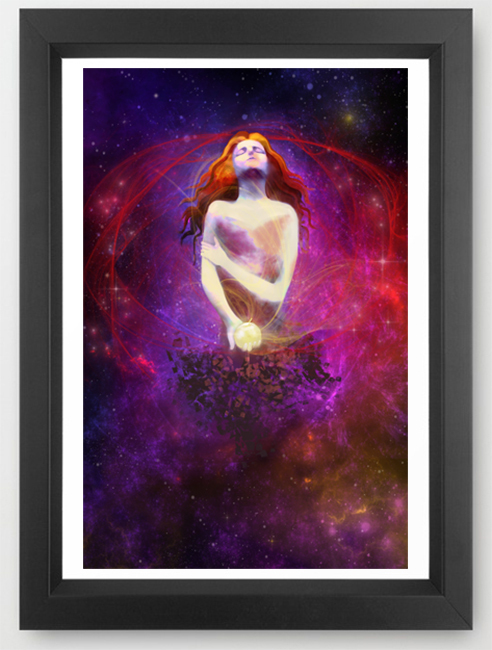 Also, the new art for the Heir of Scars book series. Continue to get as many commissions as possible so I can make my dreams come true. HaHa! 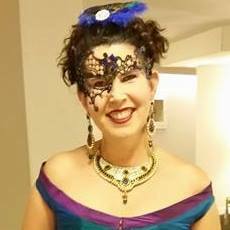 I will focus on finishing my epic novels so there’s not a gap between publishing Polly’s 5th volume and my next project. I will continue to work on the next covers for the Heir of Scars book also. My husband and I decided to agglomerate our projects under the same name, Violet West Entertainment, as we build our brand together. I want to be proud of my projects, control the outcome as much as possible and be sure it's something memorable. I might return to Polly and the Black Ink for a second arc too later. Because I work in so many different projects and styles I got used to having an escape, but there are times that I can't work at all and I need to watch animation, movies, read, learn a new technique, go to a museum or a park, do something completely different from my daily routine and refill my batteries. Things change so quickly now. Everything has an up and down side. The system or the rules change without notice, and we're forced to go with the flow or stay behind. Artists and authors will always create and try to reach their audience. The Internet allows us to publish our books, to see people engage daily with our process and become part of the process. What we do is starting to be seen more as a job. We are professionals. Also, the audience is starting to learn how to give back. It balances all the free entertainment or work they've been having access to. That's why it's important to support artists. Kickstarter and Patreon are good examples of making it possible for an artist to work full time on their craft and support themselves. I attended Katsucon last February as an artist with Polly and the Black Ink debut. I got a table and it was a great experience. The audience reacted very well to the books. We'll be attending Awesome Con DC again in June with Polly and the Black Ink and the Heir of Scars books and art. I will have book III available at our table. Next event will be Small Press Expo. We've attended it as visitors before, but this time in September we will be managing a table with our books, including Polly and the Black Ink volume IV. The downside of having a table is to be stuck behind it and miss the panels, the contests, etc. I also attend local events as much as possible, from bookstores to street art festivals when schedule allows. I had a great opportunity to publish one comic page on the Magic Bullet #14 and I intend to keep going. 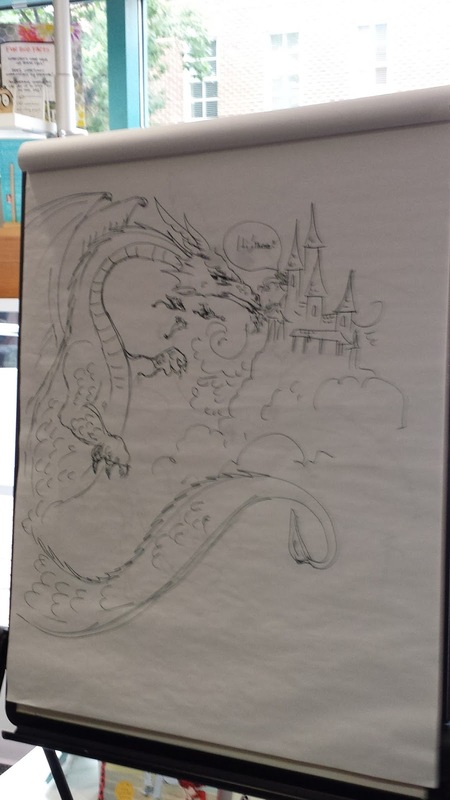 I also have an invitation from Alexandria's Duncan Branch Library, where I taught a comic book workshop last year. I will be drawing people's portrait in my cartoonish style on the street and raise money for the library during the Del Ray Street Art Festival next September 7th, 2017. Polly and I are available to attend schools, libraries and other events to share my experience as an independent author, but also to share my process and give some tips (ages 5 up). You can reach me on my official website www.vanessabettencourtart.com or contact me at vanessabettencourtart@gmail.com. I love the free museums and the food diversity. The business, political stiffness and mood of the city. The Lincoln Memorial. The size of the sculpture helps, but the entire area has soul. There are many good museums. The National Museum of Natural History is my favorite to visit over and over. I get so much inspiration from it to draw and come up with new storylines. And I have to visit the Zoo. I haven't had the chance. I love food. It's hard to pick. Each day is a different mood. From Asian to Americana. There are good seafood places in Old Town, but being Portuguese, I also miss some of the fresh and diverse seafood that we don’t have here. I keep two websites. 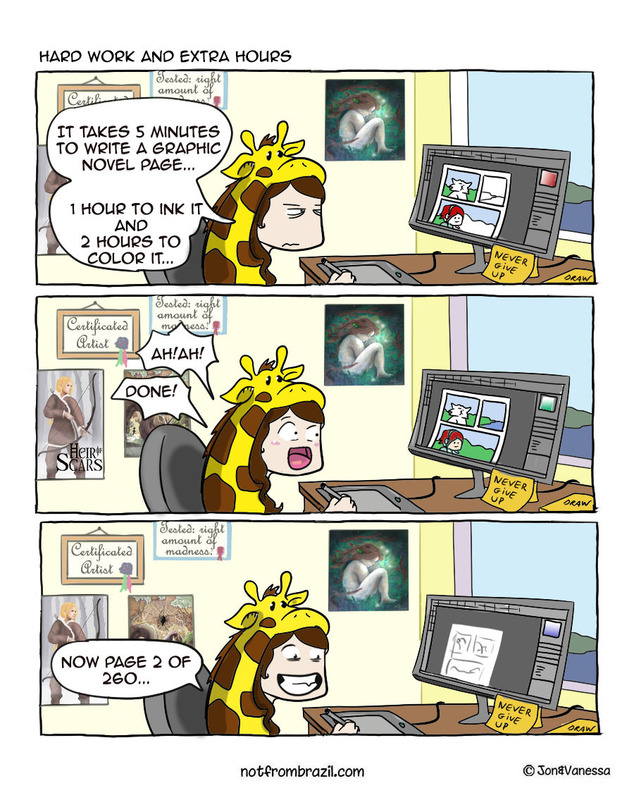 One as an artist and another for the free webcomic series notfrombrazil. 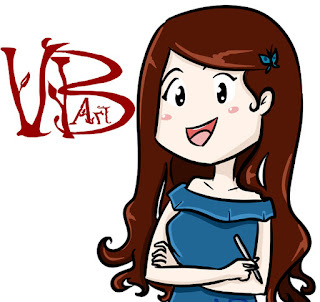 My website www.vanessabettencourtart.com has a blog where I share news of my creative process, tutorials, articles with events and book releases. People are free to subscribe to get news of the next events or book releases. For those who wish to get a weekly reminder of notfrombrazil.com subscribe to the website www.notfrombrazil.com. I add new episodes every Monday, Wednesday and Friday. You can also find the following pages on Facebook: @pollyandtheblackink, @notfrombrazil, @vanessabettencourtart and @heirofscars up to date. On Instagram: @vanessabettencourtart where I host giveaways. Comic Riffs on the return of Resist! Teresa Logan continues to Resist!